With full support of Johnson County and six partner cities, the Midwest Renewable Energy Association (MREA) is hosting a solar group buy in Johnson County, Iowa. 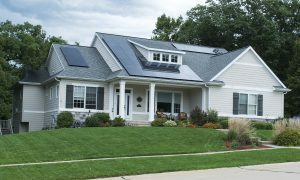 The advantage of a group buy is the power of volume purchasing, which can significantly reduce the up-front costs of installing solar on your home. The group buy is open to all Johnson County and West Branch homeowners. Dozens of solar group buys have been completed across the country in cities such as Cedar Rapids, Milwaukee, Madison, and Chicago, counties such as Linn County, and in states from California to Vermont. Common elements that have led to success include competitive contractor selection, community-led outreach with a trusted community partner, and a limited-time offering. Competitive Contractor Selection: Solarize Johnson County’s Advisory Committee is comprised of representatives from the MREA, Johnson County, and most participating cities. The MREA will issue a competitive Request for Proposals and select a single installer to help carry out the program. This way customers get the simplicity of working with a single installer, plus the confidence that the selection process was competitive. to get started. Partner cities include Coralville, Iowa City, North Liberty, Shueyville, Solon, and West Branch. Even if your city is not a formal partner, any Johnson County property owner can participate in Solarize Johnson County. Strong Customer Education: Community outreach and education are crucial to program success. MREA, a 501(c)3 nonprofit provides renewable energy training and education, works with local organizations to schedule and facilitate a number of one-hour Solar Power Hours around the community. These events help interested homeowners determine whether solar is right for them. We’ll go over the basics of solar, financials, how to tell if your site is ready for solar, and how to participate in Solarize Johnson County. Getting well-informed participants to the table saves the installer hours and hours of marketing and education they would otherwise have to do themselves, and in turn, saves you money. Connect your solar array to your home and utility with Master Electricians. “Moxie Solar is proud to partner with MREA again in 2018 and to help bring affordable solar energy to homeowners and businesses throughout Johnson County. We are excited to continue sharing our passion for solar energy within this unique and powerful partnership” said Jason Hall, Moxie Solar President.